OWINGS MILLS, Md. - Stevenson football sophomore Cortez Taylor hauled in three receptions, two of which went for scores, including the game-winner with 9:41 remaining in the second quarter as the Mustangs remained undefeated with a 20-14 victory over defending MAC champion Lebanon Valley Saturday at Mustang Stadium. Stevenson (3-0, 2-0 MAC) has started with three-straight wins for the second consecutive season. The team also posted its first win in four meetings against the Dutchmen. Highlighted by two 9-yard touchdown receptions from Taylor, the Mustangs scored the game's first 20 points to take a commanding lead with just under 10 minutes to play in the second quarter. Freshman Daniel Williams, making his first career start, also connected with sophomore Seth Jordan on a 7-yard touchdown. Williams finished the first half 8-for-16 for 103 yards and three touchdowns. Taylor and Jordan combined for five receptions for 76 yards and three scores. Stevenson totaled 167 yards of total offense in the first half while limiting Lebanon Valley (0-3, 0-2 MAC) to just 75. The Mustang defense also forced five punts and held the Dutchmen to just 3-of-8 on third-down conversions. Through three games this season, Stevenson has outscored its opponents 48-13 in the first half, including 35-6 in the second quarter. The Mustangs have also forced eight turnovers, including three with two interceptions and a fumble recovery Saturday. In the second half, Lebanon Valley used timely offense and ball control to cut its deficit to just one possession midway through the fourth quarter. After a picking off Williams on the second-straight drive, the Dutchmen finally got on the board with 5:40 left in the third on a 25-yard pass from Brian Murphy to Tyler George. The score was the first allowed by Stevenson in conference play in nine quarters, covering a span of 116:15. On its ensuing possession, Stevenson drove down to the Lebanon Valley 35-yard line before a sack and incomplete pass forced a punt. The Dutchmen began their 10th drive of the game with 1:23 remaining in the third quarter. Using a balanced attack with 10 runs and nine passes, they totaled a 19-play, 88-yard drive that used 9:34 before Murphy found Mike Smith from 11 yards out on third-and-8 to pull Lebanon Valley within a touchdown with 6:49 to play in the game. Stevenson then all, but sealed the game with a 10-play drive that used 5:25 and took the ball down to the Dutchmen 36. All 10 plays were rushes, including nine by sophomoreTrey Lee before a punt then gave the visitors one last chance to go 80 yards with 1:19 remaining. However, Murphy was intercepted on the first play by junior Billy Lewis, sealing the Mustangs' second win in the last three at home and their third in the last five in the Middle Atlantic Conference. Lewis now has six interceptions in nine career games. Lee finished with 92 yards rushing on 26 carries while senior Shane Clough had 11 tackles, one interception and two pass break-ups to lead the defense. Senior Donnell Brown also had 11 tackles. 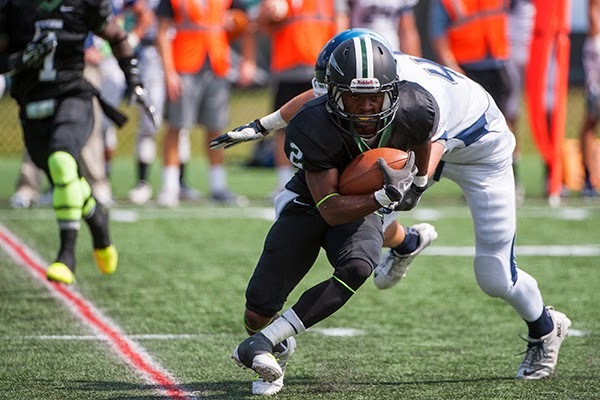 Stevenson will look for its first 4-0 start to a season in its fourth year of existence next Saturday, September 27 when it travels to Albright. Kick-off is set for 1:00 p.m., at Gene L. Shirk Stadium in Reading, Pennsylvania.